Waking to the sound of flowing water is one of life’s simplest pleasures. Despite the cascading beads of condensation that were falling from the inside wall of my tent, I couldn’t help but pulse with the feeling that this was going to be an epic day. My legs were rising fresh, despite the fatigue that robbed them of energy on the final climb the day before. I slithered out of the tent, and retrieved our bear canisters to get breakfast started. Ever since the beginning of the JMT, I had really been looking forward to hiking this southern half of the trail. I’ve had the fortune of spending quite a bit of time in the Southern Sierra, but this was my first opportunity to do a prolonged backpacking adventure in what I consider to be one of the most dramatic and beautiful ranges this world has to offer. I’m usually one to eat slowly, and sip my coffee at an even more pedestrian pace, but I was packed up and ready to go just after sunrise on this day, ready to head towards Evolution Lake. The climb from Colby Meadow started off with a few minor creek crossings. With the rising sun came the swarms of mosquitoes. Luckily, their numbers died down significantly as we gained elevation. We reached a series of switchbacks, and just after the sun began to dominate the horizon, we were standing on the banks of Evolution Lake. Evolution Lake is an absolute alpine stunner, which held us in it’s gaze for quite some time. The trail skirts the eastern shores of Evolution Lake before climbing upwards towards more alpine lakes and the iconic Muir Pass. The views here are incredible, as you can see the Evolution Peaks all around you. As we began ascending further, we ran into a group of boy scouts and their accompanying scout dads. I’m usually not one to be too chatty on the trail, but I really love seeing kids get out and enjoy the outdoors at that age. It seems that far too many people stay inside on their phones or in front of TV’s all summer, so it’s really nice to see a group out backpacking in the High Sierra. Without a constituency that sees and experiences the phenomenal power of our national parks, we won’t have a populace that’s willing to vote and pay for the incredible services and adventure they provide. The aptly named Sapphire Lake was the next point of interest that stopped us dead in our tracks. There were hundreds of little tadpoles peacefully floating in the shallow depths of the cold blue water. From Sapphire Lake the trail continued to gain in elevation, and the landscape continued to grow in all its desolate rapture. We were hiking with confidence through the Evolution Basin and up the west side of the valley. Our next stop was at Wanda Lake, a lake that takes it’s name from one of John Muir’s daughters. The cool desaturated tones of the Sierra granite offered up the perfect contrast for the rich and vibrant colors in the accompanying water and sky. After leaving Wanda Lake, it was a short but lung taxing climb to the summit of Muir Pass. One of the coolest things about Muir Pass is the stone hut that sits atop the pass. We spent quite a bit of time at the pass eating snacks, taking pictures, sitting inside the hut, and fending off a chubby little marmot who has become notorious for stealing food at this exact location. As we sat at the pass, I could see a series of huge puffy cumulus clouds beginning to form. The clouds made for a beautiful backdrop, but gave me the motivation I needed to keep hiking, as their movement and color indicated a storm was forming. I’m glad we left when we did, because being on the 11,980ft summit of Muir Pass would not have been fun in a thunderstorm. We continued downhill away from the pass, and could see the sky darkening behind us and to the left. As we made our way past the Helen Lake Outlet towards Starr Camp, a few cracks of thunder punched the air around me. I had to put my camera away for a short while as a light drizzle began to fall, but things cleared up rather dramatically as we continued to lose elevation on the trail. With the most difficult part of the day’s hiking finished, we settled into a nice downhill stroll and left the barren rockiness behind for the greenery of Big Pete Meadow. We continued on past Bishop Pass before finding a perfect little campsite in Grouse Meadow. At this point on the John Muir Trail, I started to get the feeling I was the deer whisper, as a group of three passed right through the campsite. Maybe it was the way I was smelling, but they seemed to be as comfortable around me as they would have been a tree. Julia and I pitched the tent, walked down to the creek to filter water, and settled in for another beautiful sunset. Your pictures are absolutely breathtaking and I love the quotes! sapphire lake is GORGEOUS! definitely on my bucket list now. i almost want to add the entire john muir trail too! The lakes are incredible. Looking forward to the next report! What a journey you are on! And that stone hut is really captivating. Do you know who made it? Muir Hut is an incredible icon of the JMT! It was built in 1930 as an emergency shelter from storms. Sierra Club supporter George Frederick Schwarz donated the 6k to build it. It must have been an incredible process to have the pack animals haul everything up. “Wow!” doesn’t seem sufficient. Whenever I think that this trail can’t get any more stunning, you surprise me with more. I’m looking forward to some serious research time to go over all your posts and figure out what we’d like to (or are able to—a little older/less fit than you) tackle next season. Thank you! Thanks, Caroline! The JMT is a spectacular trail. I met a lot of people that were only doing sections of the trail. Let me know if you have any questions when you start planning! This was so transporting to read. I’d probably faint if I found myself in such a beautiful landscape! And the blue skies are just stunners! Drew, will it be fine to pick your brain when I begin planning for my hike? No problem, Angie! Feel free to ask any questions that arise. Your photos are absolutely amazing! May I ask what type of lens you use to get some them to “stretch”, like the first one? Thank you. I shot all of these on my Sony a6000 and Sony 10-18mm lens. It’s a nice lens for Sony APS-C. I ended up selling it though for the Zeiss Touit 12mm, since all of my shots on the 10-18mm were at 10-12mm. Not much need for a zoom in my case. Great photos and descriptions. 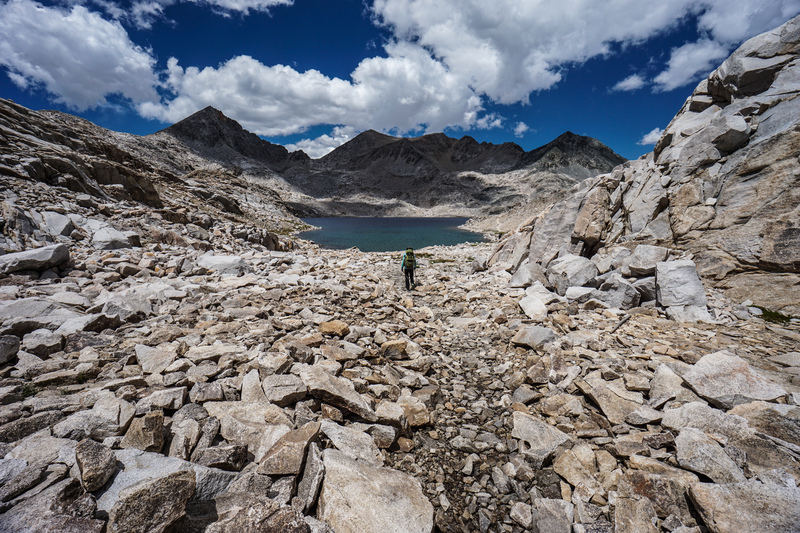 I have hiked this section of the Muir Trail and many other sections as well. The Middle Fork Kings River is the ultimate Sierra river, in my opinion. The most incredible section lies off of the Muir Trail however; it is the section between Palisade and Cartridge Creeks. Sheer rock walls and water that flows like liquid diamonds over awesome granite; this is the finest canyon I have ever been in, and I have been in MANY. I’ll have to check that one out next summer!